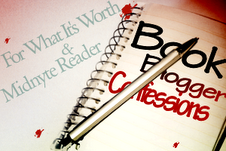 ANNOUNCEMENT: Book Blogger Confessions has been nominated for best meme for Book Blogger Twitter Con (#BBTC) hosted by Parajunkee and The Bookish Brunette. This event will take place April 1-April 7 and all of it will be held on Twitter. We are thrilled to be nominated and want to thank everyone who participates, comments and reads. Voting started March 1, 2013. Even if you don't vote for us, at least go vote! For more information on #BBTC click HERE. What do you do about people who enter your giveaways but don't follow instructions exactly? Have you ever had problems hosting a giveaway sponsored by an author or publisher who is supposed to send the prize to the winner and doesn't? How have you handled these issues? As a prize winner - what do you do if your prize never arrives? Do you contact the blogger or just let it go? Answer: I think extra entries are fine, but I try to keep mine limited so the person entering doesn't get frustrated. (Apologies if this isn't working!) I know I get frustrated when there are too many hoops to jump through. Even when said hoops are optional. I think we've all seen contests with long lists of people to follow. Sometimes I just bail in the middle of trying to complete the raffle form. When I do my own giveaways, I try to keep most things optional. Sometimes (only sometimes) I will require a follow if I feel the prize is valuable, but not often. A lot of times I'll switch up the options too. I'll ask for a Twitter follow on one contest and a Facebook follow on another. I've been mostly using Rafflecopter which is really working well. I do miss the ol' Google Docs at times or even picking the name from a comment. I liked having contests in the comments because I used to make games out of it. I even had a contest where the commenter had to look at the above comment and base an answer off of that. Rafflecopter is very helpful though in moderating, keeping track and picking a winner. I have it right in the contest post rules that if the entrant doesn't follow the rules, I reserve the right to delete that particular entry. For example, if I want them to answer a specific question in the comments and they just say "Thanks for the giveaway" I'll delete the entry. It's not fair to those who followed the instructions carefully. I sometimes have contests for people who participate in a specific Challenge I'm hosting and I'll get a lot of outside entries on those. So again, I'll delete them as well. Sometimes, if it's apparent that a person is just confused by a technicality or maybe there's a language barrier, I'll e-mail them with instructions on how to fix things. The other thing I always worry about is if a person doesn't get back to me within the alloted time. However, this has rarely happened. A few times issues had been made, but I had already picked another winner. Even though I say 48 or 72 hours, I *always* give extra time. Luckily I have actually never had a problem with a publisher or author not sending a prize. At least I've never gotten notification about it. As a winner if I don't receive a prize, I usually let it go. I don't know why. Maybe I'm embarrassed, don't want to seem whiny and/or greedy. I do remember one time that I didn't receive a book I had won and some other stuff and I did e-mail the host blogger. I was told that the author sent out the prizes. So, I figured that was that. Luckily, the author (Adrian Pheonix) is so kind she contacted me and sent me out another book and told me she would replace the other items as well. I told her not worry about that -- I just wanted the signed book! So what do you guys do with your contests? Do you find Rafflecopter is the best method? What are some issues or problems you've had and how do you resolve them? Labels: Book Blogger Confessions, Giveaways. I'm with you on going through so many hoops! I feel so frustrated when I see someone has so many entries, but at the same time, I like when they have more than 2 because I feel like I have more chances of winning. I'm also with you on feeling sorry for people who don't answer on time. I haven't come to that yet, but I dread the moment when I do. Great answers! :) and CONGRATS on the meme nomination! I used to try to fix every entry - entering it myself but I think Rafflecopter has made it so simple now that I don't bother. the instructions are right there. I have one person who enters all of my giveaways but for some reason Rafflecopter doesn't work for her so I never her information for her. I don't usually follow blogs just to enter a giveaway, but if they have freebie entries and I start to recognize their blog from lots of giveaways, I usually follow. I can't stand it if there are more than 10 ways to enter and even more than 5 seems like a bit much. @Sunny-I never thought of it that way...the more entries, the better your chances. @Karen-I'm lazy too. Sometimes it feel like it is so much work to enter a contest. @Steph-I don't do that either. I mean it's usually a book and I can get it from the library. I try to keep my entries to 5 or under. I've never contacted anyone if I didn't receive a prize. It didn't seem like such a big deal, especially since the only times that has occurred were during readathons. As lame as it sounds, sharing my love of reading with others and making new friends are enough for me. Rafflecopter is nice when it comes to avoiding the hoops of extra entries. One can just pick and chose and leave it at that. But I do wish I could pick from commenters. Oh well. I've opted out of the meme this time, because I've never hosted a giveaway, so it's not like my post could be useful. But I would like to comment about the topic. This is something I've posted on Karen's blog too, but with a different wording, because I'd have felt bad about a simple copy-and-past :). When it comes to giveaways, I have a huge problem...social networks entries. Because I'm not a member of any - except Goodreads, that is not your tipical s.n. anyway - nor I'm planning to be. I'm aware I'm in the minority, but still - there must be someone else in the world who doesn't feel the need to open a FB - T - G+ page. Or who actually is a member of only one social network. I don't hold it against the hosts if they want to advertise their blogs, but maybe, sometimes, they could be contented with having people following them via GFC or email...Having said so, I'm not sure if not complying with all the conditions does damage one's chances of winning or not. Maybe someone can explain it to me. Thanks :). Great new layout BTW. Though it now makes me think about sunset more than about the midnight hour. Love your choice of colours anyway! i'm so glad you found me! I'm totally loving this meme, thanks for the outlet, i'm your newest bff! I don't enter many giveaways anymore... in part because I feel pretty guilty about my backed up TBR piles, but also because so many of them feel like work. I love the idea of using comments and making a game out of it. I hate seeing giveaways with hundreds of entries but only one or two comments.